« This week in Dairy: shake up some butter! Valentine’s day on a Monday is like a gift to parents with school-aged children. While I love the idea of making things (hence, this blog), for the past couple of years, this “holiday” has caught me unprepared the night before trying desperately to come up with something for almost 40 of my children’s classmates. Oh, the despair of the unprepared parent on the night before! 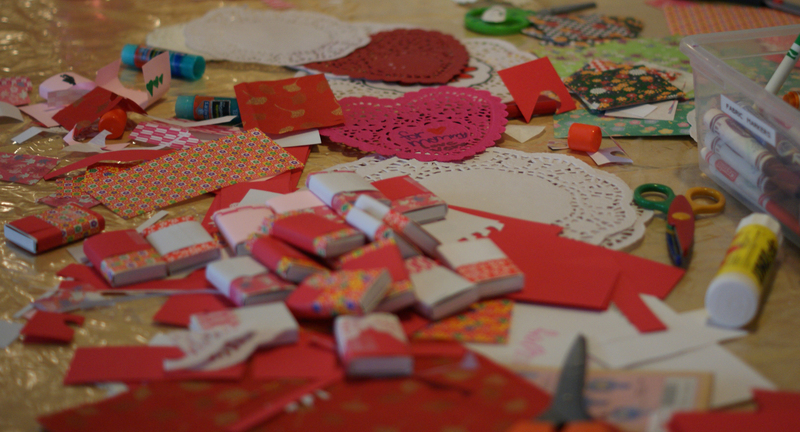 This year however, we had a whole weekend stretched out before us and the girls wanted to make their own cards. A couple of years ago, I came across a post on Inchmark showing valentines made out of matchboxes. At the time, I didn’t have nearly enough empty matchboxes lying around (a sad reflection on our lack of restaurant-going these days), so I set out for Amazon and soon had 100 blank boxes in my possession. 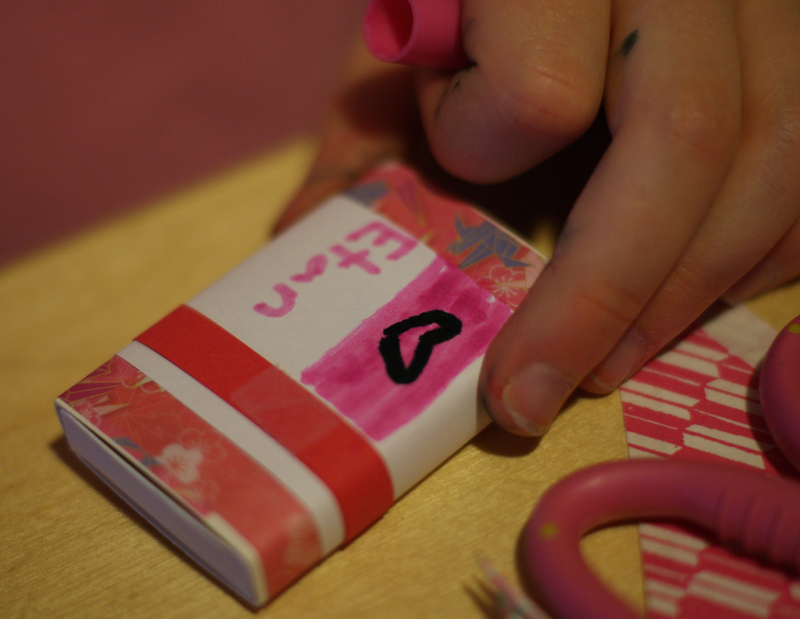 Once you have emptied out the matches, all you need is some scrap paper, tape, glue and markers and you are on your way to making mini-valentine boxes of chocolates. Boxes so small, not even the most rabid anti-sugar crusaders could fault you for passing them out. Not on Valentine’s day, at least. Using red and pink construction paper, scrap origami sheets and doilies, my husband and I helped the girls wrap the boxes. At least the first couple. 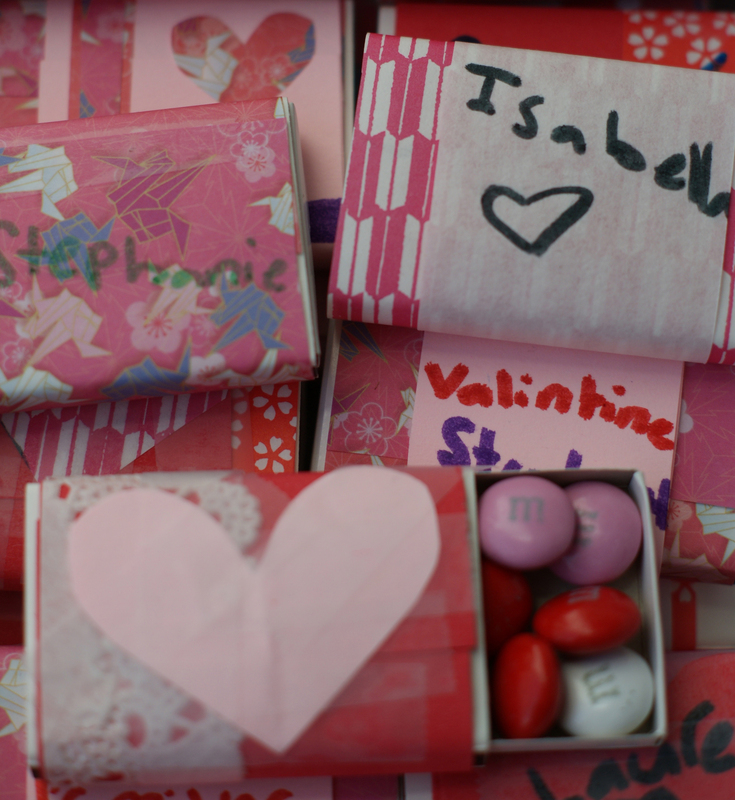 The wrapping was actually kind of frustrating for the young, and fearing we would lose their attention altogether, we set up an assembly line whereby my husband and I wrapped the boxes and the girls decorated them with the names of each of their classmates. Next, came their favorite part: filling the boxes with m&m’s. 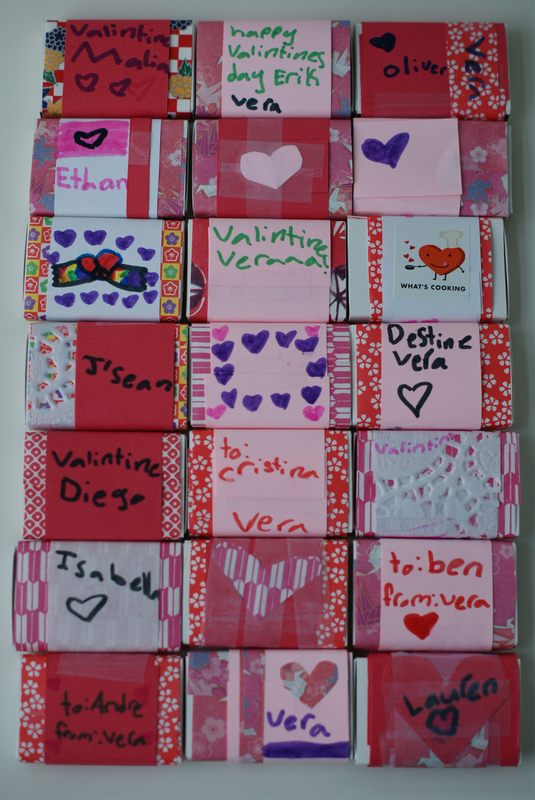 Using the “one for the box, two for me” method, their valentines were done in no time! A completely pleasant way to spend an afternoon. If you have an excess of match boxes cluttering up your home, this is your project. It doesn’t even need to be for Valentine’s day – who wouldn’t welcome an extremely small box filled with chocolate on any day of the year? Happy Valentine’s Day! Update: So, I must admit I was feeling pretty awesome about sending my kids off to school with their groovy valentines. That lasted for about 20 minutes until my husband called and told me the teacher reminded everyone at drop-off about the “no candy in the valentines” rule. Oops, guess I didn’t get that memo. But of course, why would one send extra junk food to school when they are getting plenty of it in their school lunch? Next year, I suppose I will have to fill the boxes with raisins. Or matches. This entry was posted on February 14, 2011, 6:58 am and is filed under kids, make. You can follow any responses to this entry through RSS 2.0. You can leave a response, or trackback from your own site. Does Ethan get the Ethan or the Etan box? Totally forgot about valentines day this year. I guess no Shrek Valentines cards with lollipops for the classs. What is Valentine’s Day without candy?! The idea of sending actual matches next year made me laugh out loud. Love it. So so cute! I love the girls’ work this year. 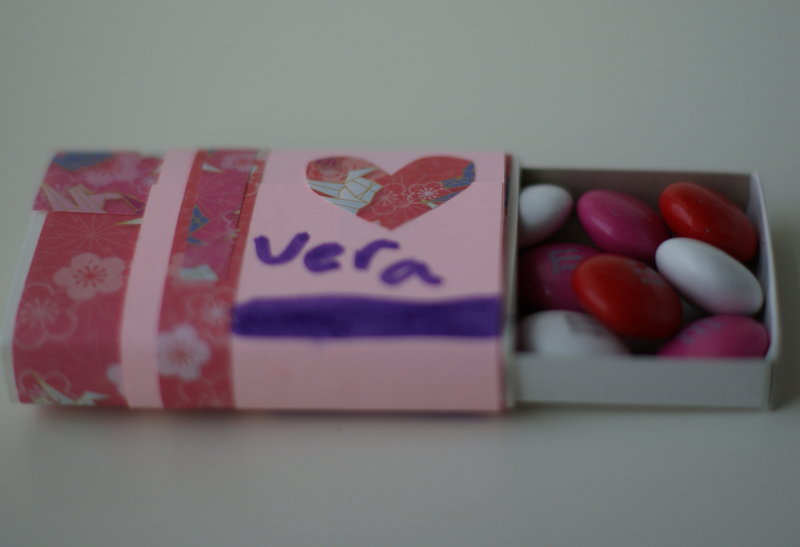 This reminds me, too, that the red ones you made in 2009 were some of the prettiest valentines I’ve ever seen! Next time fill them with Googly eyes! Seriously, what a great crafty idea and the new blog layout looks great!